Ferran Fages works in the field of free improvised music in different context- from subtle guitar explorations of timbre, to more robust dynamics in the midfield of electro-acoustic music with turnatble experimentations and electronics. He also takes his sounds in different art form- contemporary dance and theatre (collaborations with Olga Mesa, Carme Torrent) and poetry. From 1999 onward he is a member of IBA col.lectiu d’ improvisació. Inside this collective he organises IMPROVISA- Festival Internacional de música i danca improvisades de Barcelona,. He is a member of Cremaster duo along with accordionist and electrophonician Alfredo Costa Monteiro. They share common intrests of researching soundfield inside noise thru various means of sound usage. and lately regulary creates with trumpeter Ruth Barberán (in Error Focus from 1998) and australian percussionits Will Guthire and french improvisor Jean Phillipe Grosss in trio Voitbruts (from 2004). 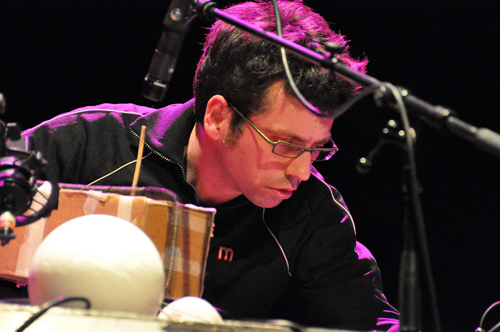 In his career so far he has played or recorded with Joan Saura, Agustí Fernández, Jakob Draminsky, Franck Stofer, Antón Ignorant, Stefan Prins,Derek Bailey, Margarida García, Francisco López, Andrea Neumann, Phil Niblock, Taku Unami, Masahiko Okura, Masafumi Ezaki, Bukhard Beins, Guiseppe Ielasi, Mark Wastell, Will Guthrie among others.